On 1 April 2017 in Trinity College Chapel Cambridge CB2 1TQ, the New Cambridge Singers (NCS), conductor Graham Walker give the premiere of Giles Swayne's Everybloom in a concert entitled Renaissance Reimagined, with Swayne's new piece for choir and viols alongside a work by the winner of NCS's composition competition, Paul Newton-Jackson, Thomas Tallis's Spem in Alium and music by William Byrd and Orlando Lassus, and they will be joined by the New Vialles viol consort. The concert is repeated at St James's Church, Sussex Gardens, London on Saturday 22 April, 2017. The audience can get involved too, Paul Newton-Jackson's new piece Then the angel showed me the river has an audience chorus, and audience members are invited to join the choir for this and for Tallis's canon Glory to thee, my God, this night. I spoke to Giles Swayne and Graham Walker to find out more. For those wanting to learn more about Giles Swayne's new piece, there is an open rehearsal on Wednesday 1 March 2017 at Parkside Theatre, Parkside Community College, Parkside, Cambridge, CB1 1EH, when people will get the chance to hear the new work in rehearsal as well as being able meet and chat with Giles Swayne. 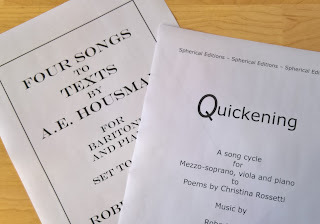 Those interested should email openrehearsal@newcambridgesingers.org.uk. Conductor Graham Walker is hoping that the open rehearsal will help audience members to get to know Giles Swayne's remarkable piece. A setting of an extraordinary text form James Joyce's Ulysses, Graham feels that open rehearsal will help both the choir and the audience get closer to the work. 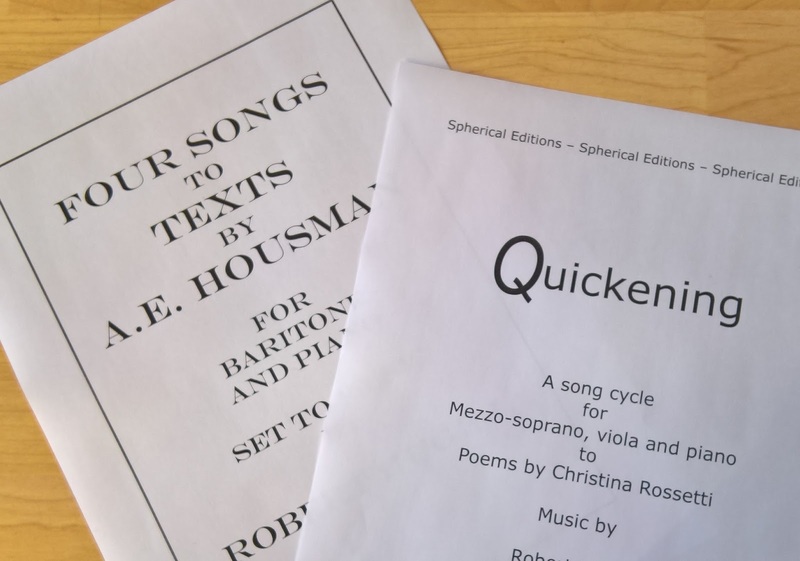 New Cambridge Singers has a history of commissioning new pieces, and as a cellist with experience of playing baroque cello Graham thought combining choir and viols was an an interesting idea. 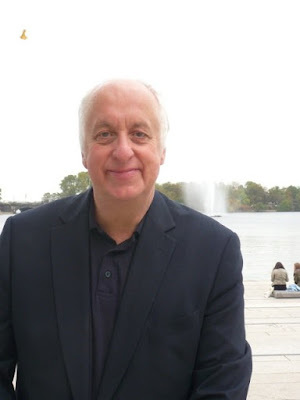 He had already taken part in a piece which Giles Swayne wrote for choir and cello, so the idea of Giles Swayne's new piece Everybloom was born. Walker sees Everybloom as being a piece about memory, and he feels the haunting sound of viols work well in this context. 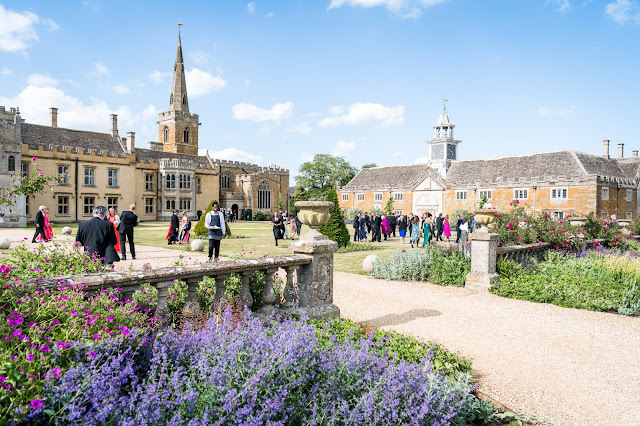 New Cambridge Singers is choir of around 38 adults from in and around the Cambridge area, combining those on the University staff with townsfolk and those from further afield. Set up in the 1980s, Graham took over four years ago. Last year they ran a composition competition, and part of the brief was to include a choral part for audience members, which Graham sees as a way of enlivening the project. The winning piece Then the angel showed me the river, a setting of a text from the Book of Revelation by Paul Newton-Jackson includes an audience part which not only includes standard homophonic music but has aleatoric passages too, which Graham thinks will be an interesting challenge to the audience. Giles Swayne was given a fairly open brief about the commission, and he finds the combination of choir and viols interesting though admits to some degree of nervousness about the balance as he has never written for this distinctive combination before, but where possible the viols are used when there is not too much choral texture. The text came about because Giles came across a wonderful passage in Joyce's Ulysses where Joyce goes through a series of pastiches of English style from Middle English to 20th century, and this includes a pastiche of the King James Bible, 'Therefore, everyman, look to that last end that is thy death', and so Swayne read further in the book and ended up setting a series of short passages in what he calls a 'strange collage of words'. The piece opens with what Giles calls a 'mad litany', from the early part of the book, which he sees as being all about guilt (something which resonates with Swayne who had a Roman Catholic upbringing), with the choir taking various roles such as prostitutes, passers-by and magistrates. A tenor solo also relates to youth, sexuality and guilt, whilst extracts from the episode of Leopold Bloom at Paddy Dignam's funeral yields a contrast between polite mourning and rude comments about death, including what Swayne sees as an extraordinary line 'Once you are dead, you are dead'. The pastiche from the King James Bible is written as a chorale with occasional flourishes on the bass viol. Perhaps the most famous passage comes from Molly Bloom's soliloquy, including what Swayne describes as a really orgasmic 'Yes'. This is very much stream of consciousness, and this sense of memory runs through the text of the whole piece. The wonderful language contemplating the past, the future, death and what comes after. And Molly Bloom's soliloquy brings an acceptance of what is, which is what Giles finds so wonderful about the book. The English Symphony Orchestra (ESO) and its chief conductor Kenneth Woods are launching a 21st Symphony Project, a commission for nine composers to write nine symphonies to be premiered by the ESO. The project is being launched with the premiere of the Symphony No. 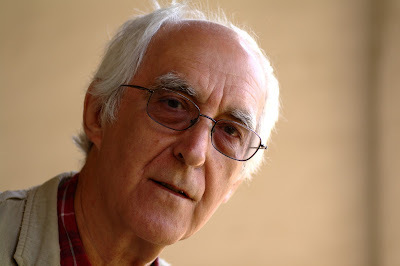 3 by Philip Sawyers, ESO's John McCabe Composer-in-Association, at St John's Smith Square tonight (28 February 2017). Kenneth Woods conducts the ESO in Sawyers new symphony, Fanfare for Brass and Songs of Loss and Regret (with soprano April Fredrick), plus Mozart's Piano Concerto No. 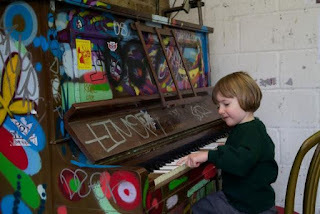 20 in D Minor, K. 466 with Clare Hammond. Sawyer's Symphony No.3 was commissioned a couple of years ago to celebrate Kenneth Woods new partnership with the English Symphony Orchestra (Woods became chief conductor of the ESO in 2013), and the commission became the starting point for ESO's ambitious symphony project. This continues in 2018 when the orchestra gives the premiere of David Matthew's Symphony No. 9. 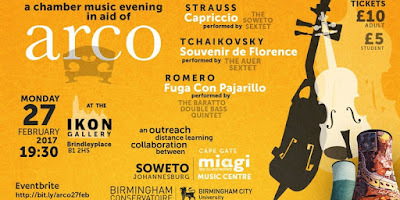 This evening (27 February 2017) at the IKON Gallery in Birmingham students from Birmingham Conservatoire are hosting an evening of chamber music in aid of ARCO, a project which enables young students in South Africa to participate in weekly instrumental lessons via Skype with academics, students and alumni from Birmingham Conservatoire and Birmingham City University. The eclectic programme includes music by Richard Strauss, Aldemaro Romero and Tchaikovsky. The evening has been organised by Alistair Rutherford, a final year viola student who is one of the ARCO project's tutors. 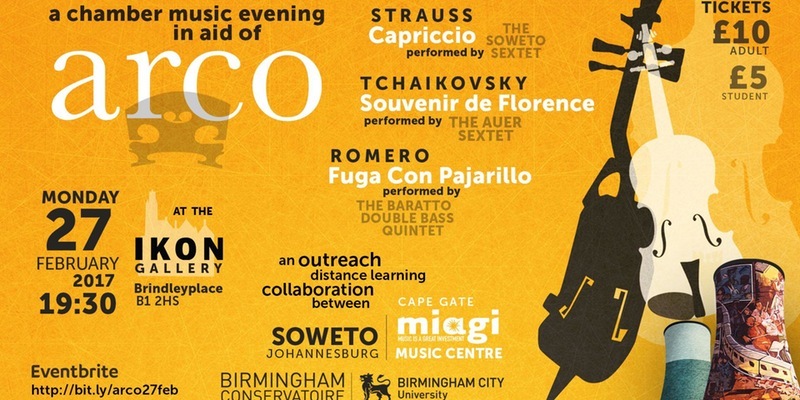 ARCO is a collaboration between Cape Gate MIAGI Centre for Music & Birmingham Conservatoire, and since it was established in 2015, 24 strings students aged between eight and 16 in South Africa have been selected to participate in weekly instrumental Skype lessons, in addition to the regular lessons as the Cape Gate MIAGI Centre for Music. As well as providing transformative music education activities, Conservatoire staff have been acting as role models for vulnerable youngsters living in Soweto, a Joahnnesburg township deeply affected by poverty and crime. Full information and tickets from Eventbrite. Treble Angus Benton won the BBC Radio 2 Young Choristers of the Year Competition in 2015, and last year he made this recording Homeward Bound with pianist Malcolm Archer on the Convivium Records label. Benton and Archer perform an attractive mix of songs by Handel, Michael Head, Malcolm Archer, RVW, and folk songs arranged by Phyllis Tate, Malcolm Archer, Benjamin Britten and Jay Althouse. 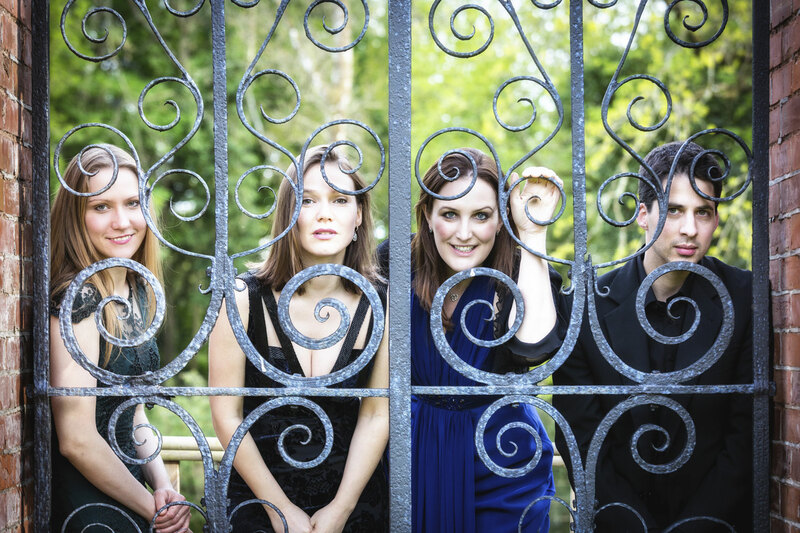 For some of the songs Benton and Archer are joined by Julia Desbruslais (cello), Gareth Hulse (oboe) and Karen Wills (flute/piccolo). A percentage of sales of the CD goes to support the NSPCC. 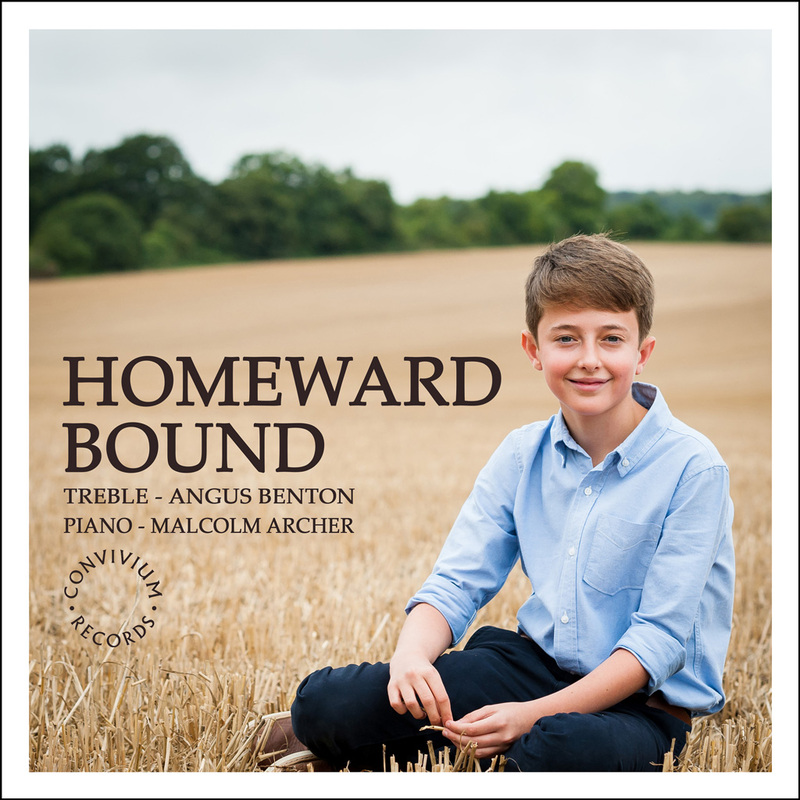 Angus Benton was 12 at the the time the recording was made in 2016, and was then one of the sixteen Quiristers forming the treble line in the Chapel Choir of Winchester College, where Malcolm Archer is Director of Chapel Music. Archer says in his introduction to the disc that the idea behind the recording was to capture Angus's voice whilst it was still at its best. Benton has a nice clear voice with a lovely focused sound, not large but well formed with a lovely sweet sound, and his diction is admirable. His programme is a typical mix of art songs and folk songs, including a new song The song wandering Aengus written specially for him by Malcolm Archer. 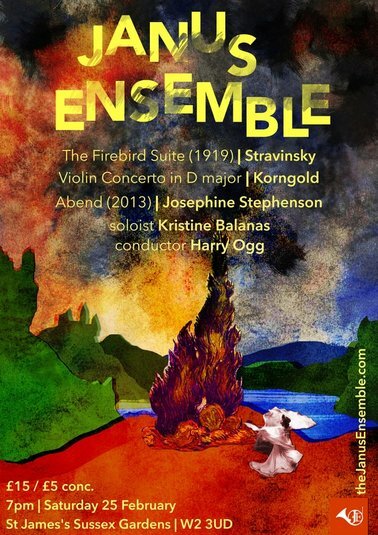 25 February 2017 sees a striking orchestral programme at St James's Church, Sussex Gardens, Paddington when Harry Ogg conducts the Janus Ensemble in Stravinsky's Firebird Suite, Korngold's Violin Concerto and Josephine Stephenson's Abend. The soloist in the Korngold is the young Latvian violinist Kristina Balanas, whose repertoire seems to include an interesting array of 20th century concertos. Erich Korngold retired from writing film music at the end of World War Two, and devoted himself to concert music. The Violin Concerto was written at the urging of the great violinist Bronislaw Huberman. Dedicated to Alma Mahler, the widow of the composer, the concerto was premiered in 1947 by Jascha Heifetz. It is a richly romantic piece which requires the soloist to really wear their heart on their sleeve. 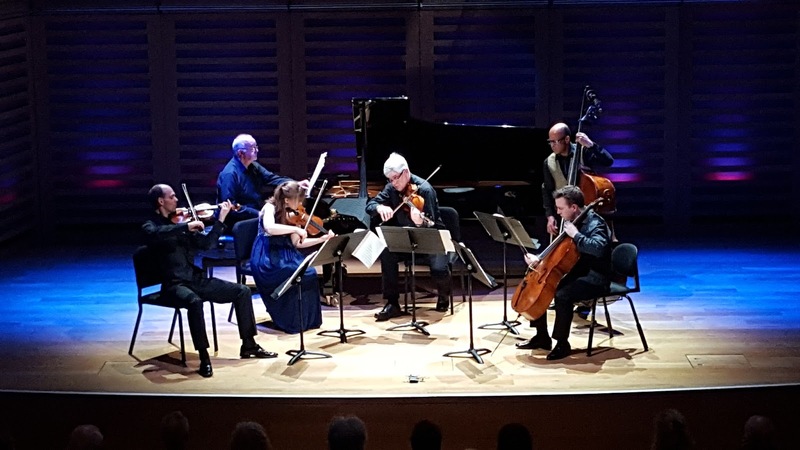 The Janus Ensemble was founded in January 2015 by Charlotte Amherst and its two resident conductors Michael Coleby and Davide Levi, with the aim of bringing together aspiring young professional musicians at the outset of their careers. Further information from the Janus Ensemble website. The music of Mieczyslav Weinberg is beginning to gather pace in its rate of discovery on disc. His opera The Idiot has received its first recording (see my review), whilst The Passenger is available on DVD in David Pountney's much-travelled production, and violinist Linus Roth has issued recordings of the violin concertante and chamber works (see my review). Violinist Gidon Kremer played Weinberg's Violin Concerto with Kristjan Järvi and the Baltic Sea Philharmonic in their tour last year (see my interview with Kristjan). 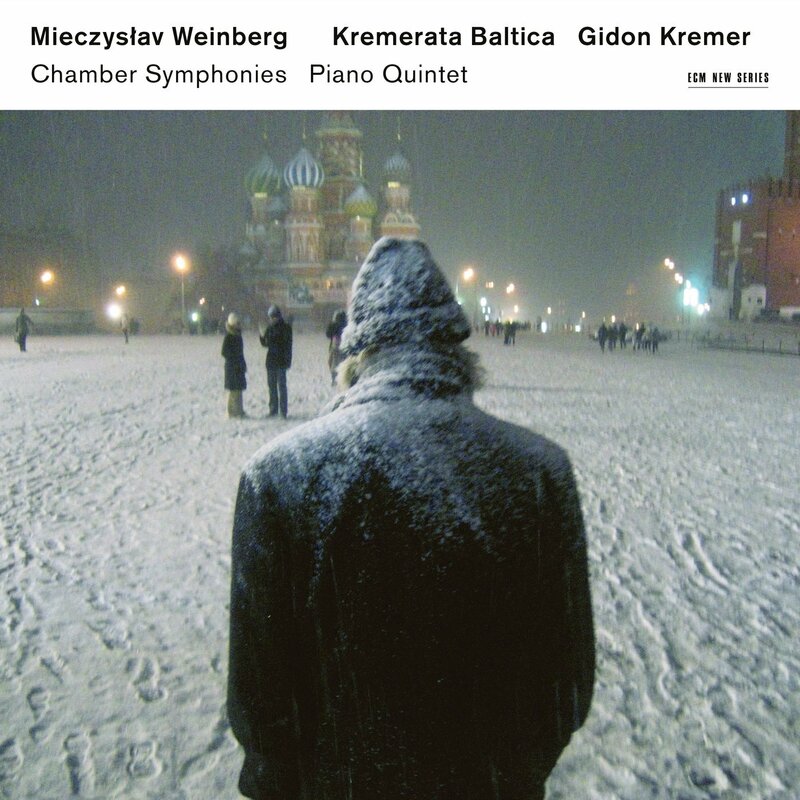 Now Gidon Kremer and his Kremerata Baltica have recorded Weinberg's chamber symphonies for ECM. 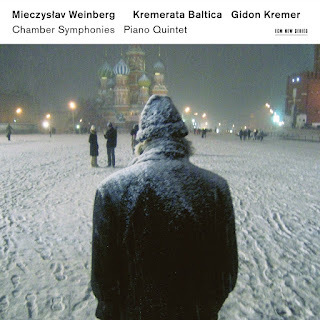 On this double Cd set, Kremer and the Kremerata Baltica are joined by percussionist Andrei Pushkarev, pianist Yulianna Avdeeva, clarinettist Mate Bekavac and conductor Mirga Grazinyte-Tyla to perform Chamber Symphony No. 1, Op.145, Chamber Symphony No. 2, Op.147, Chamber Symphony No. 3, Op. 151, Chamber Symphony No. 4, Op. 153 and Piano Quintet Op.18 (in a new orchestration by Andrei Pushkarev and Gidon Kremer). The chamber symphonies are predominantly written for string orchestra, but the second has a solo violin and timpani, whilst the fourth has clarinet and triangle and is the only one on the disc performed with a conductor (Mirga Grazinyte-Tyla). Weinberg's chamber symphonies have an intriguing history. The first two were issued in 1986 and 1987, and in 1990 Weinberg was awarded the State Prize for the works. In fact two chamber symphonies were based on Weinberg's second and third string quartets which he wrote in the 1940s. The third chamber symphony followed in 1990, based on his fifth string quartet (from 1945). Only the fourth chamber symphony (1992) is not based directly on a previous work (though the music is very self referential). Weinberg kept the links between the works quiet, and the fact only came to light after his death. So it is not surprising that Gidon Kremer decided to add to these a new orchestration of Weinberg's Piano Quintet from 1945. 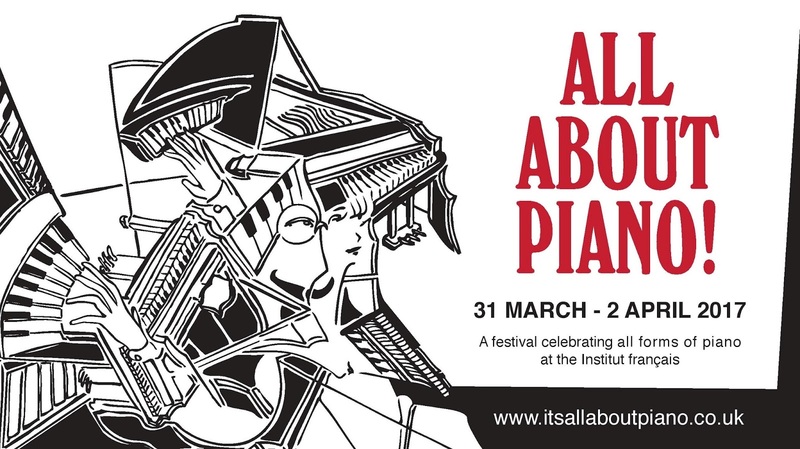 In 2013, to celebrate the restoration of its piano the Insitut francais in South Kensington, London organised the It's All About Piano festival. This year they are celebrating the fifth festival with artists including Melvyn Tan, Yaron Herrman, Tristran Pfaff, Ulrich Gerhartz, Cedric Pescia, Ivan Ilic, Barry Douglas, Ismael Margain & Guillaume Bellom, the Fidelio Trio, Marcela Roggeri & François Chaplin, in concerts ranging from classical to jazz, from films to family. 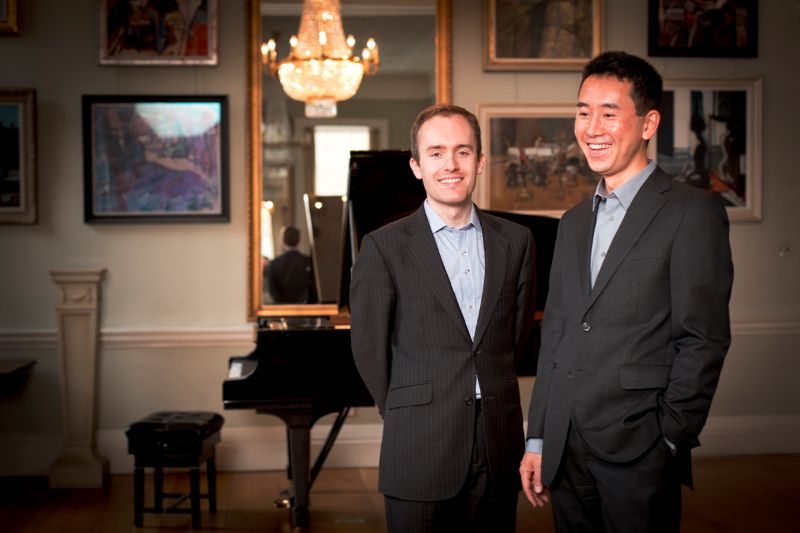 Highlights include Melvyn Tan in Beethoven, Jonathan Dove and Liszt, and he is also giving a masterclass, jazz improvisation from Yaron Hermann whose influences include traditional Israeli music, Ivan Ilic in music by Antoine Reicha, Barry Douglas in Schubert, Brahms and Tchaikovsky, and there is a talk from Steinway's master piano tuner, Ulrich Gerhartz, on the prepared piano whilst pianist Cedric Pescia will be performing some of John Cage's works for prepared piano. 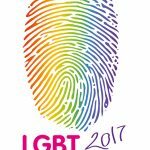 The festival runs from 31 March to 2 April 2017 at Institut francais du Royaume-Uni,17 Queensberry Place, London SW7 2DT, full details from the festival website. 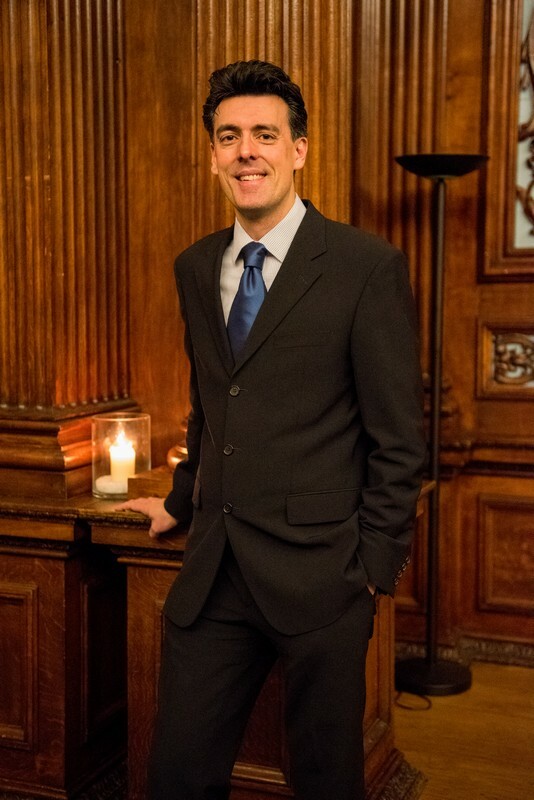 In the 1960s, Birmingham Town Hall played host to All-Night Jazz Festival gigs, and this has inspired John Thwaites, head of keyboard studies at Birmingham Conservatoire, to create an All-Night Pianothon at Birmingham Town Hall. So from 7.30pm, Friday March 3, to 7.30am, Saturday March 4, 2017, the town hall will play host to a star galaxy of pianists including Gergely Bogányi, Alistair McGowan, Peter Donohoe, Mark Bebbington, Margaret Fingerhut, Daniel Browell, Pei-Chun Liao, Di Xiao, David Quigley, Julian Jacobson... Simon Callow will be giving a rare performance of Richard Strauss's Enoch Arden with John Thwaites, Dr Anna Scott takes a look at ‘Brahms as he might have heard it’, student Nafis Umerkulova plays Schumann’s First Piano Sonata on an historic instrument made by Clara Schumann’s cousin W Wieck, and prize-winning pianists and tutors from the Conservatoire’s own ranks are showcased throughout. 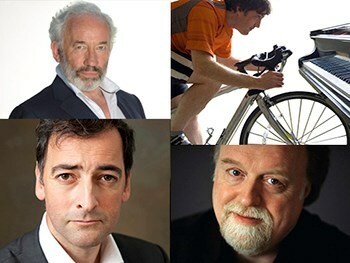 Alistair MacGowan will be playing Satie, and Anthony Hewitt will be cycling through the night to arrive a dawn to play Ravel's Gaspard de la Nuit. To encourage young people and students, prices start at £1! Full details from the Birmingham Conservatoire website. 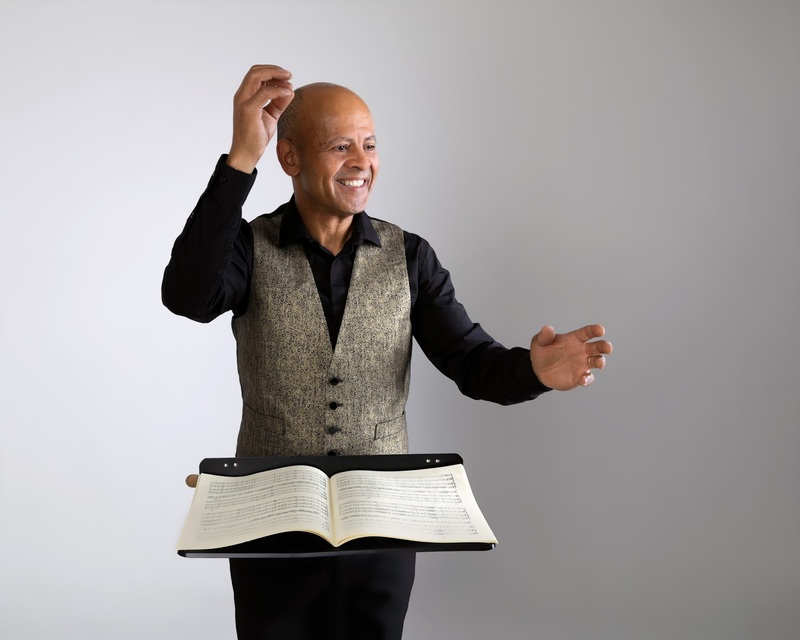 Outre-mémoire (beyond memory) by Thierry Pécou, a work which looks at aspects of the slave trade refracted through the medium of music, is being performed by Pécou and his Ensemble Variances at St John's Smith Square on Wednesday 22 February 2017. The work was originally written for pianist Alexandre Tharaud who premiered it in 2004. Pécou's own roots are in the Caribbean, so for the piece he took a more distant perspective on the slave trade and its effects, a painter who travelled around the world, visited the countries of origin and the final destinations of the slaves and made paintings along the way. And when exhibited together, the impressions form the story of 300 years of the slave trade. 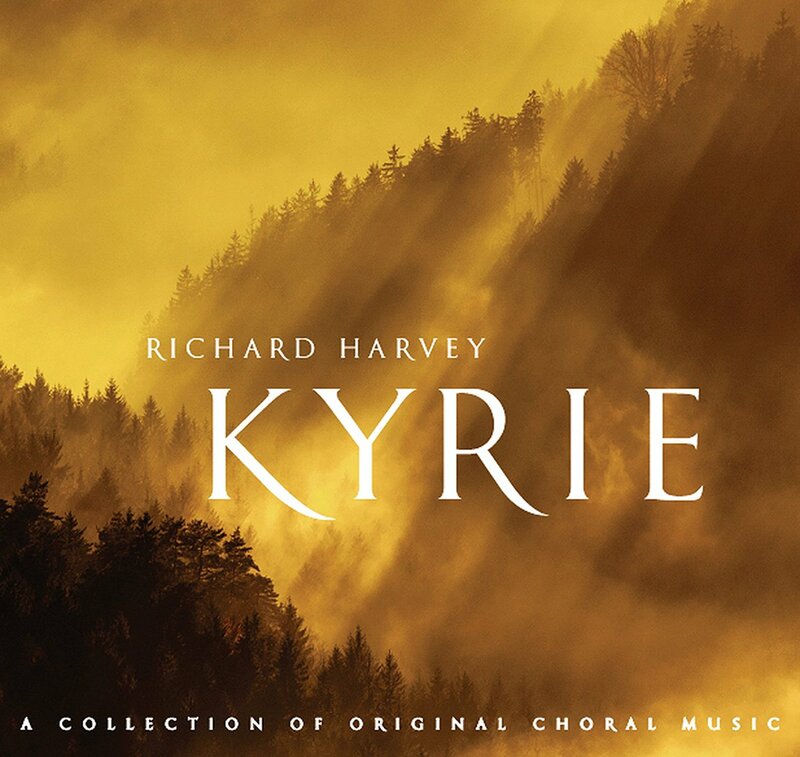 The result is harmonious and hypnotising like a ritual, alternating dark harmonies with violent rhythms, all written for piano, flute, clarinet and cello. 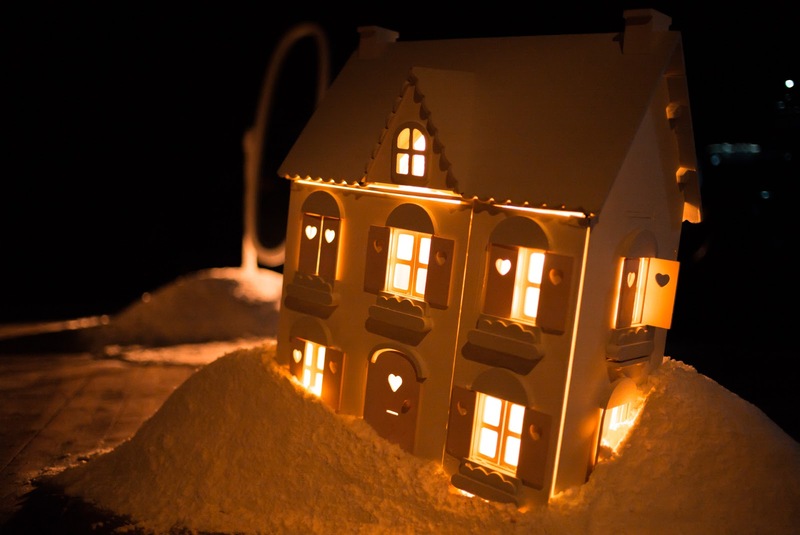 Snow is the first production from a new opera company, The Opera Story. With a libretto by JL Williams based on the Snow White story, the opera featured music by Lewis Murphy, Lucie Treacher and Tom Floyd (an act each). 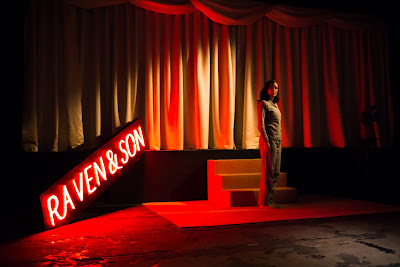 It was premiered on Monday 20 February 2017 at the CLF Art Cafe / Bussey Building in Peckham in a production directed by James Hurley with designs by Rachel Szmukler and lighting by Ben Pickersgill. Alice Privett was Snow White, with Rick Zwart as the King and Prince Raven, plus Polly Leech, Alison Langer and Cliff Zammit Stevens. Christopher Stark conducted an ensemble of 12 instrumentalists. The Opera Story was founded by Manuel Fajardo and Hamish Mackay, and for their first production they decided upon a new opera based around the story of Snow White, not the tradition Disney version but one refracted through different European folk tales. JL Williams' poetic libretto took three episodes, and each of these acts was given music by a different composer. 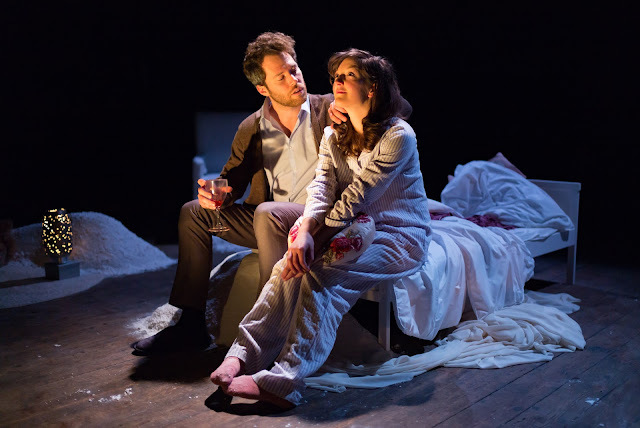 To add to the feeling of differentiation, each act was performed in a different space in the Bussey Building so that we started on the third floor for act one, and worked our way down. The performance was given in the round, with the audience sitting and standing, very much an immersive experience. The organisation was impressive, getting the audience moved each time as well as moving the harp and the tuned percussion, no mean feat, but it meant that designer Rachel Szmukler could create three contrasting environments. Because three different folk-traditions had been used, the narrative in the three acts was to a certain extent discontinuous and director James Hurley used this creatively by keeping Alice Privett's Snow White on stage all the time, an older woman remembering. 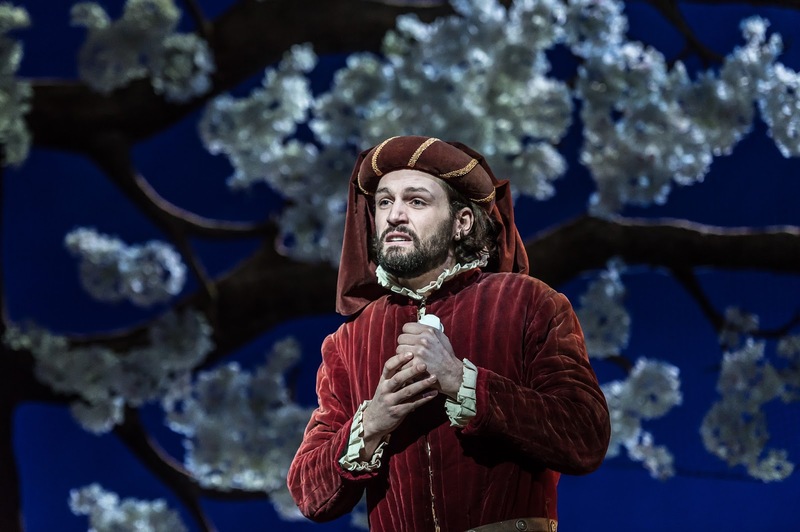 It was Privett who was key to the performance, being the only character who appeared in all three acts and whose coherent characterisation through three very different operas gave us a thread to lead us through the piece. Folk-tales are elliptical things, the very quality which makes them tricky to use yet tempting in opera. 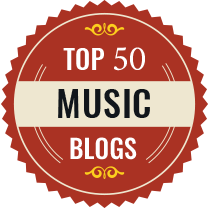 The tangential nature of the story telling, using archetypes rather than real people, leaves plenty of space for the music. James Hurley's production seemed rather too content to tell the story simply but effectively, leaving any psychological insights to the music. Fairy tales are full of Freudian suggestion. Sometimes directors rather go too overboard in this direction, but in Snow I rather wanted more psychological suggestion. 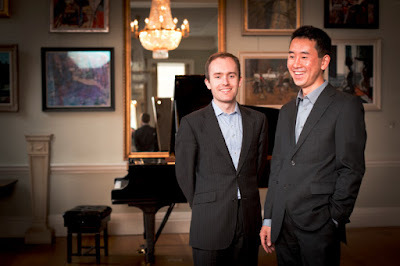 Simon Callaghan and Hiroaki Takenouchi, the Parnassius Piano Duo, brought a striking programme of works for two pianos to St John's Smith Square for the Sunday afternoon concert, 19 February 2017. They opened with Hubert Parry's rarely performed Grosses Duo in E minor, following it with Leonard Bernstein's two-piano arrangement of Aaron Copland's El Salon Mexico. The programme was completed with the premiere of the duo's own two-piano arrangement of Sergei Rachmaninov's mammoth Symphony No. 2. Written in the mid-1870s when the composer was still in his 20s and had not yet full developed his recognised style, Parry's Grosses Duo is a large-scale and eminently serious work. Each of the three movements makes a rather Brahmsian exploration of Baroque counterpoint, but shot through with the sort of bravura which makes the whole invigorating listening. This was Bach's counterpoint viewed through a 19th century lens, and from the opening notes of the Allegro energico first movement we could appreciate the rich textures which Parry created with just four hands at two pianos. Of course it helped that we were listening to a well matched pair of huge Steinways played by such a long-established piano duo. 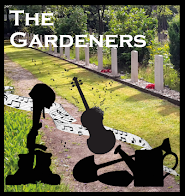 The second movement was a gentle Siciliano which, for all the movement's gentle lilt, included some remarkably elaborate figuration and rich textures. The final movement started with a very impressive long crescendo which led to the concluding fugue, based on a very strikingly angular fugue subject. The sheer business of the fugue subject kept the movement bubbling along to a terrific climax. This seems to have been something of a weekend for rare English piano duo works, having heard RVW's Introduction and Fugue on Friday (see my article), and I did wonder whether RVW knew the Parry work (RVW studied with Parry in the 1890s). 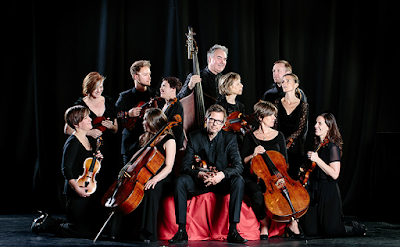 The Scottish Ensemble, artistic director Jonathan Morton, brought a diverse programme to the Wigmore Hall on Saturday 18 February 2017, centred on a pair of violin concertos played by Alina Ibragimova, Bach's Violin Concerto in E major, BWV1042 and Karl Amadeus Harmann's wartime masterpiece Concerto Funebre. The Scottish Ensemble played two of Mendelssohn's early string symphonies plus Arvo Pärt's Silouan's Song and Peteris Vasks' Viatore. The Scottish Ensemble began each half with Mendelssohn, the three movement String Symphony No. 6 in E flat (from 1821 when Mendelssohn was 12), and No. 10 in B minor (from 1823). Though these are remarkable works for a teenager, once you have got over the composer's young age and spotted the influences, and traces of the mature Mendelssohn, the pieces very much rely on the performers to sell them. And this the Scottish Ensemble did, playing with vivid presence, great engagement and liveliness. The contrast with Pärt's Silouan's Song, which followed in the first half, could not have been greater. Made from a few simple building blocks and a great deal of silence, the piece received a performance which was very intent even in the passages which were barely there. And the quality of the group's silences was amazing. Welsh National Opera's 2017/18 season starts with a Russian-themed Autumn with Tchaikovsky's Eugene Onegin, Mussorgsky's Khovanshchina and Janacek's From the House of the Dead (which is based on a book by Dostoyevsky), all part of R17, a cultural exploration of the centenary of the Russian Revolution involving arts organisations across Wales. 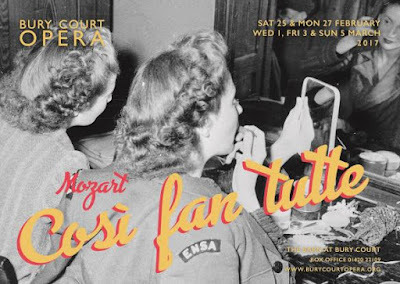 The Spring 2018 season, Rabble Rousers includes Verdi's La forza del destino (the first in a planned new Verdi trilogy), Mozart's Don Giovanni and Puccini's Tosca. 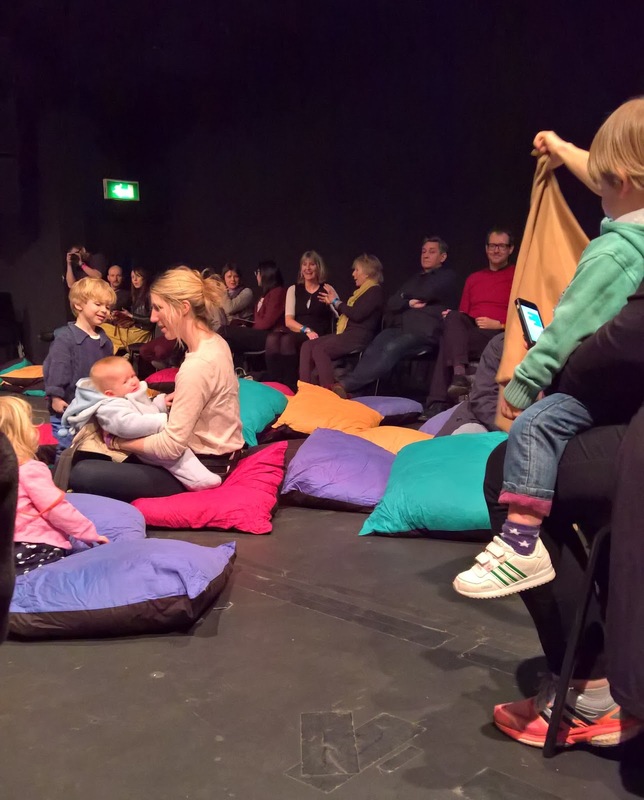 And in Summer 2018 there will be the premiere of a new work by Elena Langer a smaller-scale entertainment touring to venues across England and Wales. The revival of Eugene Onegin is conducted by Latvian Ainars Rubikis with Nicholas Lester (whom we last saw as Dandini in Opera Holland Parks 2016 La Cenerentola) in the title role and Natalya Romaniw as Tatyana (a role she sang at Garsington last year, see my review). The revivals of From the House of the Dead and Khovanshchina will be directed by David Pountney and conducted by WNO's music director Tomas Hanus and the casts will feature a number of singers appearing in both productions including Robert Hayward, Mark Le Brocq and Adrian Thompson. From the House of the Dead will be the premiere of a new critical edition by John Tyrrell. Also in Autumn 2017, WNO will give the premiere of Tom Green's The World's Wife a piece for soprano and string quartet with a libretto by Carol Ann Duffy which looks at the men of history from the perspective of their better halves. 2018 marks the start of a new trilogy of Verdi operas which WNO is producing in collaboration with Oper der Stadt Bonn. Verdi's La forza del destino premieres in Spring 2018, with Un ballo in maschera in Spring 2019 and Les Vepres Sicilienne in 2020. 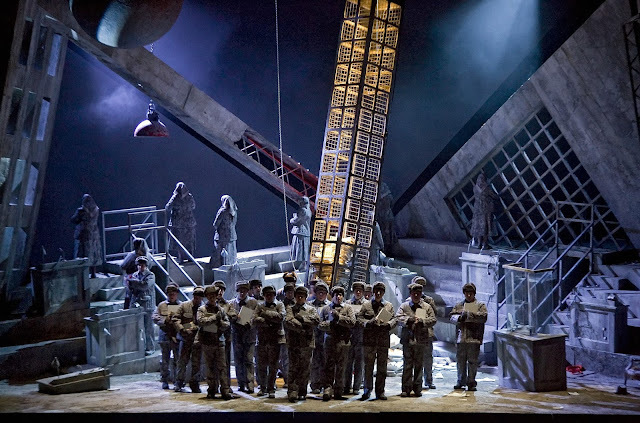 The operas will all be conducted by Carlo Rizzi and directed by David Pountney. The design team, Raimond Bauer, Marie-Jeanne Lecca and Fabrice Kebour, will be creating a 'design machine' common to all three opera but capable of making each look different. The cast for La forza del destino includes Gwyn Hughes Jones as Don Alvaro, Mary Elizabeth Williams as Leonora and Luis Cansino as Don Carlo, plus Mikos Sebestyen, Justina Gringyte, and Donald Maxwell. 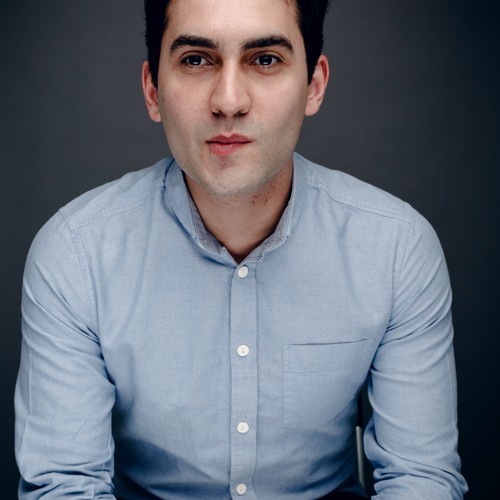 Kerem Hasan joins WNO as associate conductor, initially assisting Carlo Rizzi on La forza del destino. The Spring season is completed by a revival of John Caird's production of Mozart's Don Giovanni which includes Elizabeth Watts as Elvira and David Stout as Leporello, and Puccini's Tosca conducted by Carlo Rizzi with Claire Rutter and Mary Elizabeth Williams in the title role, Hector Sandoval and Gwyn Hughes Jones as Cavaradossi and Mark Doss as Scarpia. Summer 2018 sees the world premiere of Rhondda Rips is up! a new entertainment by Elena Langer. The composer describes it as a vaudeville or cabaret. It has a libretto by Emma Jenkins in which an all female cast, including soprano Lesley Garrett, tells the story of the Welsh suffragette Margaret Haig Thomas. The production's small scale will enable it to tour to venues across England and Wales including the Hackney Empire. 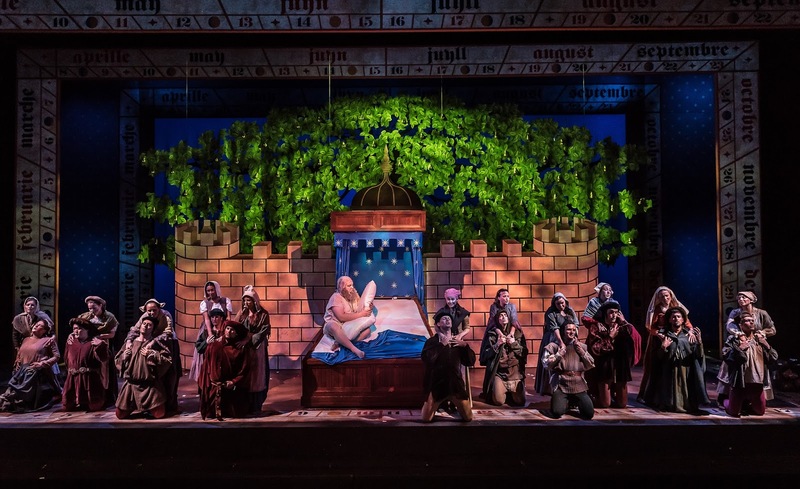 Elena Langer's previous opera Figaro gets a divorce was a great success as part of WNO's 2015/16 season.